AVerMedia, leader in video capturing technology, is proud to announce the availability of the CN311-H, an M.2, HDMI 1.4a 4k (4096x2160 30fps) capture card for integration in medical imaging devices, education and industrial computers. 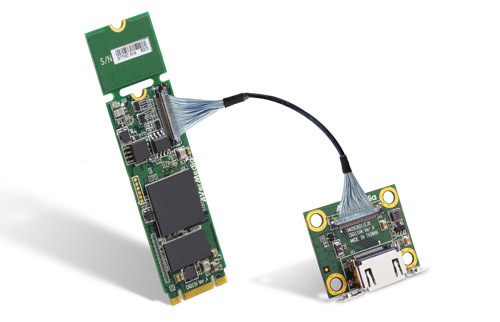 The CN311-H comes in a flexible M.2 2260 or 2280 form factor and its separate HDMI I/O board with coaxial cable can easily be implemented in custom solutions and optimizes signal stability. With its hardware-based video engine, the CN311-H reduces CPU or GPU workload by performing tasks such as de-Interlacing, color space conversion and hardware scaling all on-board. The CN311-H is the most versatile M.2 video capture card on the market. With the power to capture the 4K video source, the CN311-H can fit in most embedded systems. The advantage of 10-bit encoding makes the CN311-H capable of operating in high-end medical solutions. As the CN311-H is the first 4K video capturing solution in M.2 format, this allows for unique and innovative designs for medical solutions where high color precision and resolution is required. AVerMedia’s hardware-based video engine technology implements practical video processing functions, such as de-interlacing for enhanced image clarity, color space conversion for more true-to-life video color, and resolution scaling to lessen CPU intensive workloads. This, together with various HDMI signal optimizations, cuts down input lag and overall workload. Industrial customers can develop vertical applications flexibly and efficiently by using AVerMedia’s exclusive designer SDK with features such as device control, media capture, A/V processing and more. Regular customers can enjoy the flexibility that the capture engine offers by tweaking various codecs’ compression and decompression setting for optimum bit-rates and video quality. CN311-H can be deployed in a broad spectrum of platforms under Windows and Linux platforms, both 32 and 64 bit.